High quality bathroom rugs and a beautiful color. 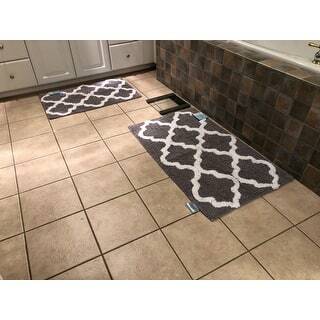 Bring life to your bathroom with the premium 100% Cotton 2 Piece Trellis Bathroom Mat Set. The Trellis pattern brings a European regal look right to your bathroom. A transparent anti-skid spray latex backing is added for keeping rugs safely in place. These super absorbent 100% cotton rugs are machine washable. 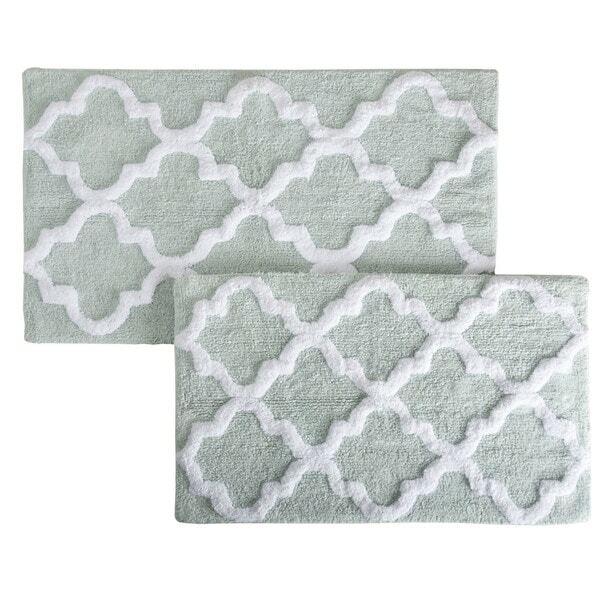 Extremely plush with cut loop velour finish, this bath mat set feels as luxurious as it looks. Great value for this level of quality! Rugs feel great under my feet - very plush and they look great! These have a high end look and are a perfect size to put one under the sink and one in front of the shower. Very happy. These bath rugs are very nice quality. 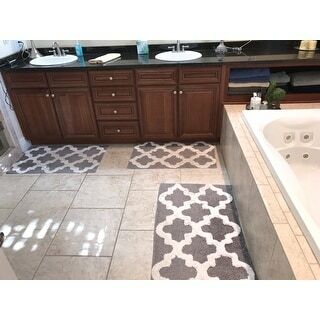 I wanted some non-skid backed rugs for my bathroom that aren't just plane. The moroccan pattern is very nice and they look luxurious in my all white bathroom. I looked all over the internet for rugs similar to these for our master bath. I was thrilled to find them and ordered two sets so I'd have a second large one in the little toilet room. They're the perfect size in front of each sink and the tub, as well as in front of the toilet. I was surprised that the trellis design is actually raised and reminds me of cotton balls - it looks really nice. The rugs are very soft and don't slide on the tile floor when walked on. I was very surprised to discover they need to be hand washed; obviously I wasn't paying close enough attention when I read the description before making the purchase. In all honesty I likely wouldn't have bought them had I known that. I haven't washed them yet, but will soon. I have a hand-wash cycle on my washing machine so will use that as it's very gentle and I expect the rugs will be just fine. I'm very happy with my purchase. If I remember, I'll update this review after washing the rugs. I am absolutely floored at the amazing quality of these bathroom floor rugs! Wow! Windsor Home products didn't hold back when they made these. I'm going to definitely purchase another color in this style for our second bathroom. They're so thick, soft, and really beautiful mats. Extremely well made too. I love this set. I am not a fan of the old thick rugs. This has a more natural feel, It is soft and natural feeling. It grips the tile and does not skid. Best of all, it is machine washable. I wanted rugs that would blend in and not contrast with my new white and gray tile floors. I bought this in white. Perfect! Love it! All I can say is, "Wow"!! I never realized how difficult it was to find a good quality rug! I'm serious, it's very time consuming. I swear I must have looked at a dozen different places and you could see the lack of quality even in just a picture. Then I tried "Overstock.com" and my look was over! This was on the very first page of my search! I loved the look so I figured I probably wouldn't love the price, WRONG! I can't believe I got two rugs for much less than what I expected to pay for one! The best part is, the quality is amazing! The color is just what I wanted too! Talk about a perfect transaction, it was even delivered in no time! I can see me spending a lot more time shopping Overstock, my new favorite store! Oh, I forgot to mention, the tag on the rug stated to wash it by hand for the first few washes to avoid large amounts of lint. I wasn't put off by this, I was grateful that I was given the heads up! I appreciate the honesty very much, thank you! Not sure about the color of the rugs. But they arrive quickly and as soon as I put them on my bathroom floors, they match perfectly! I like the materials and they are machine washable. I will buy different color for the other bathroom. Very soft, comfortable bath rug. Together with the same design larger mat, it adds beautiful colors to our Re-designed bathroom. Strongly recommend. I absolutely love these rugs. I got the three piece set. They are so soft on your feet. And they wash and dry wonderfully! I am having a difficult time finding the words as to why I don’t really like these mats. They are a good size, good quality, soft and not scratchy. I think it is the white “cottony” design part. It doesn’t look quite like in the picture. Overall, the white zig-zag part looks cheap and tacky when seen in person (though I may be over critical). Love the color. But larger then expected and the pile is not as thick as I expected. Seems to flatten after just a few minutes when they are walked on. Quality was below my expectation. Would not recommend for a small bath area or one that has heavy traffic as I have to constantly reposition and shake them out to fluff the pile. First time I washed, the fabric faded and the blue bled into the white. Looks dirty and old after one wash. Awesome product! Very soft and looks just like the pictures. Rugs arrived and looked just like I saw online. Very happy. They are soft and look nice. DO NOT put them in the washer, wash them by hand. Love these rugs! So thick and nice!!! Like the look. Hopefully it has a high-end feel. "is item 23578659 gray and white?" There are different color options available in the drop down menu.